I love this recipe. I can make it for breakfast, lunch, or dinner. It is basically two toasted tortillas with cheese and whichever ingredients I have at the moment. What I like about this is that it can be made with just about anything, essentially all you need is the tortillas and the cheese holds it all together. Usually I make this crunchy little snack with tomatoes, scallions, peppers, and mozzarella. It is a perfect and healthy midday bite to hold one over until dinner. 1. Place one of the tortillas into a medium skillet over medium-low heat to begin toasting. 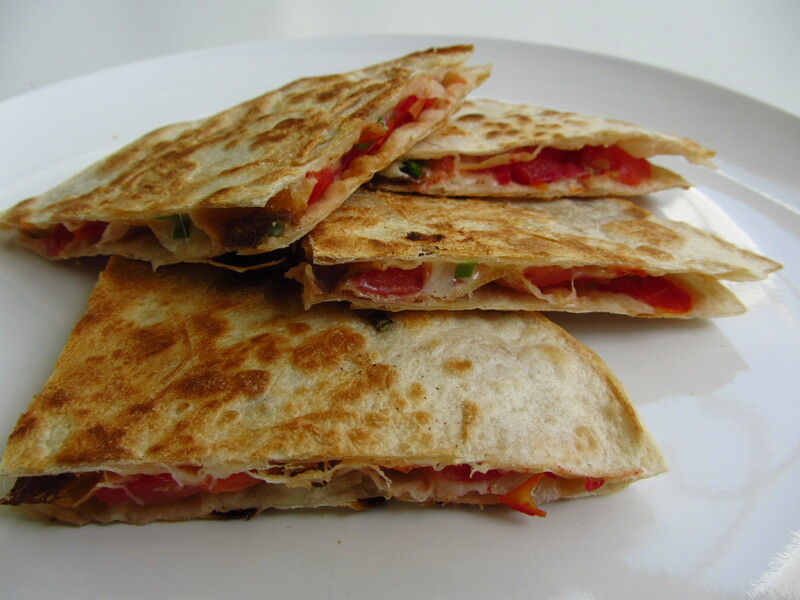 Evenly spread the cheese, bell peppers, tomato, scallion, and a small pinch each of salt and pepper over the tortilla. Top with the second tortilla. 2. Once the first tortilla has toasted, carefully flip (so you don’t lose any filling!) and continue to cook until cheese is melted and second tortilla is toasted. Cut into wedges to serve.